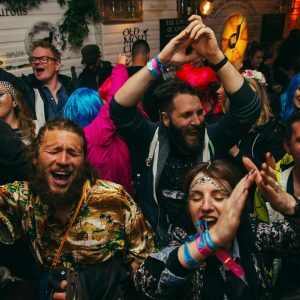 Rockaoke Festivals - The ultimate festival experience! 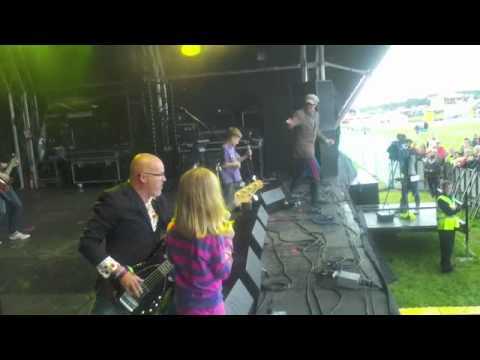 …Chris Evans’ shout-out to the crowd following his debut as a Rockaoke co-host on the main stage at Carfest South – july 2012. 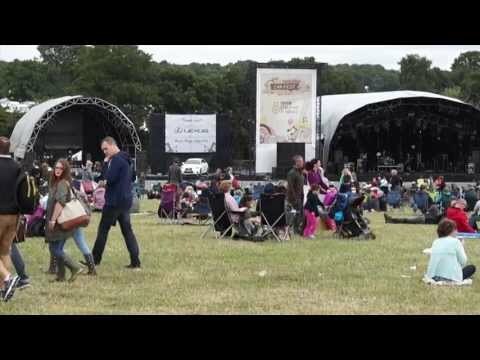 The 6,000 strong crowd was Rockaoke’s biggest festival audience to date – until two weeks later when 10,000 people at Carfest North watched in awe as all-comers jumped on stage with the band to belt out their favourite songs. Big Stage Rockaoke has become very popular at major festivals. 2015’s fun included main stage action at British Summer Time in Hyde Park and Standon Calling. This followed 2 years opening the show at Carfest in 2013 and 2012 and five years in the infamous Dog House at Download. It all started at Jamie Oliver’s Big Feastival in 2011. ROCKAOKE’s intro to UK festival life was V 2007 when they performed in the Virgin Radio VIP area and were joined on stage by James Corden, Christian O’Connell and Al Murray ( singing Queen of course!). They were subsequently featured in OK Magazine’s review of the festival! 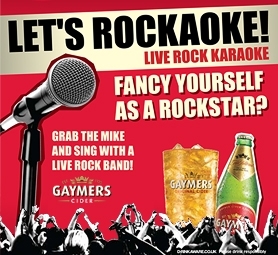 2008 saw the start of a great 3 year relationship with Gaymers Cider that took ROCKAOKE to major festivals like Rockness, O2, Bestival, Hard Rock Calling, Latitude, Big Chill, Leeds and Reading. Happy Days!! A monster night at the Camden Crawl 2010 aftershow party led to Rockaoke being given their own day at Camden Crawl 2011. It was this same year they started their legendary residency in the Dog House at Download. 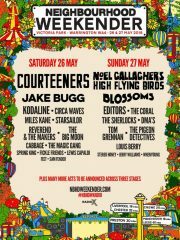 Celebrity fans invited them to to their main stages in 2011 at Jamie Oliver’s Big Feastival and then Chris Evan’s Carfests in 2012 and 2013. 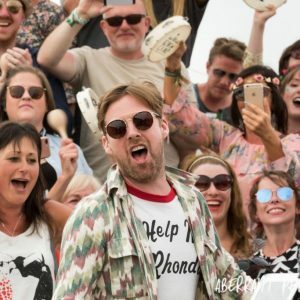 The band were also asked to the iconic Isle of Wight Festival in ’13 and ’14 where they not only cracked through Rockaoke sets but also ruffled up the revellers with Musical Chaos – a live band, interactive music quiz. 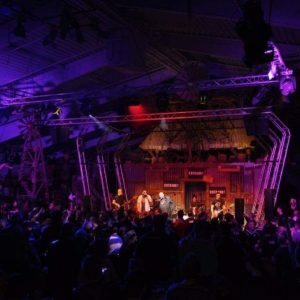 In 2015, Rockaoke had the pleasure of playing at London’s latest musical extravaganza, British Summer Time festival. They entertained thousands of people on a number of balmy evenings in Hyde Park. 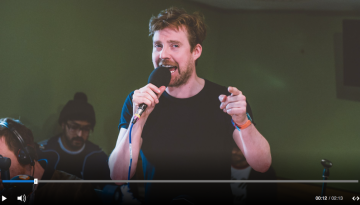 After 7 years of playing Standon Calling they finally made it to the main stage, giving regular visitors their taste of stardom with the whole festival looking on. 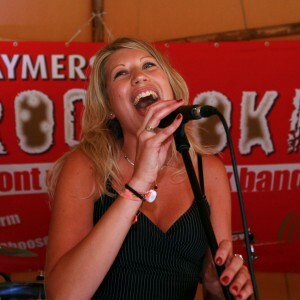 Rockaoke have a great passion for playing the smaller boutique festivals like Standon, Festival No.6, Secret Garden Party and Kendall Calling. Nothing beats the smaller UK festivals for cool, chilled-out, unadulterated fun amongst friends old and new! 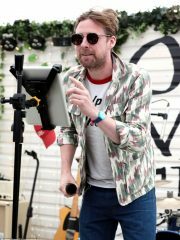 Several major brands have engaged ROCKAOKE to provide exciting, edgy, interactive, fun and above all memorable entertainment as part of their experiential marketing campaigns at major UK festivals. 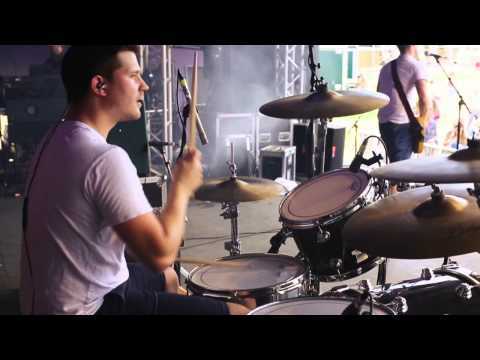 Between 2008-2010, Rockoake were the focal point of Gaymer Cider’s festival activation across major music festivals including Rockness, Wireless, Hard Rock Calling, Leeds, Latitude, The Big Chill and Bestival. Three daily sets would draw crowds of hundreds who would sing, drink and dance away the day within the brand experience. 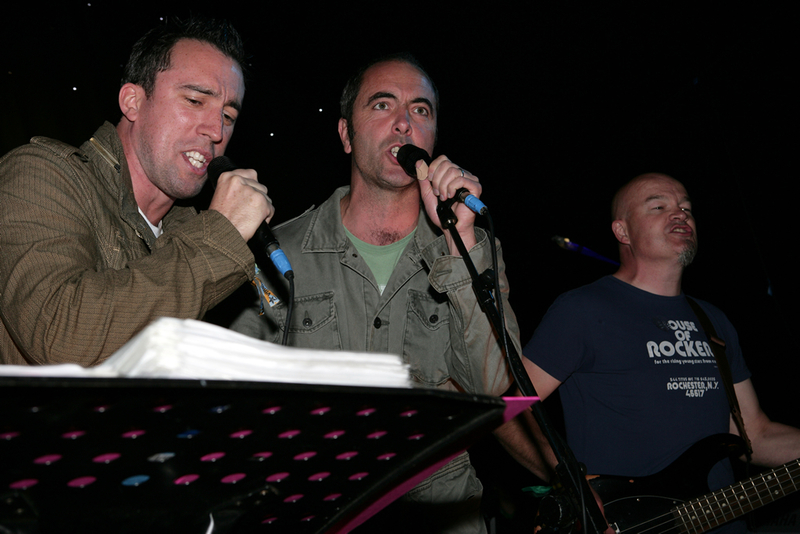 In the year 2010, Rockaoke were given the opportunity to headline their own festival! 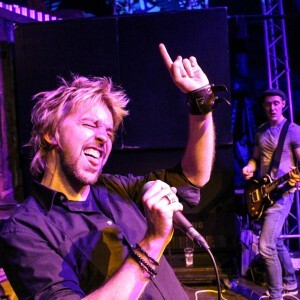 Tribute was held at the Empire Music Hall in Belfast and featured a special guest appearance from Chesney Hawkes. 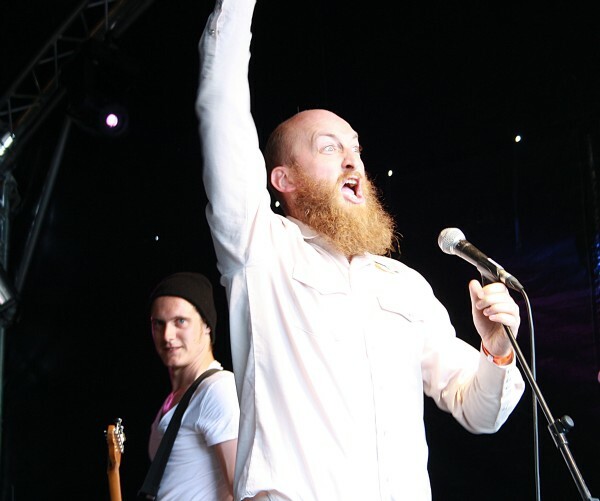 Some of our favourite photos from ROCKAOKE festival appearances. Four hours before the Police bade their final farewell to Britain, a karaoke contestant called Steve was belting out Message in a Bottle in a tent a few hundred feet from Hard Rock Calling’s main stage. 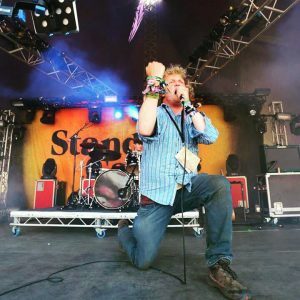 A middle-aged man in a Stranglers T-shirt, Steve had a gritty voice for a Sting stand-in, but still he managed what none of the afternoon’s paid acts could – he got a crowd going crazy. 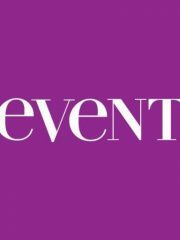 …it was our first festival and everyone from the staff on the entrance gate to Chris Evans were great. My son obviously thought being in a band with you guys was the best thing about the day. Thank you for all your help this weekend – everyone had a brilliant time!